If the Trump administration were a movie, we’d have arrived at a point in the film where the soundtrack rises to an ominous crescendo. The question is not so much whether Trump will erupt in rage but when, and where he will direct it. Washington has grown obsessed with the possibility that President Trump will fire Robert Mueller — perhaps, as Democrats are now murmuring, as soon as before Christmas. But it now seems at least as probable that the president will not lash out directly at Mueller, but instead attempt to seize control of his investigation indirectly by replacing Mueller’s supervisor, Rod Rosenstein. Over the last several months, in an effort to delegitimize Mueller’s investigation, Republicans have floated a succession of pseudo-outrages or conspiracy theories purporting to reveal Mueller and the FBI to be fatally biased. The pace at which these theories have appeared is accelerating. In October, Republicans in Congress began to excitedly discuss a 2009 uranium deal, which they portrayed as a Clintonian conspiracy covered up by the FBI (it was in fact largely innocuous and did not involve Hillary Clinton). Shortly afterward, they began to fixate on the role of the firm that hired Christopher Steele to investigate Trump’s connections to Russia during the campaign, a pattern they bizarrely twisted to conclude that the FBI had been manipulated by Russia. Last week, two more accusations appeared. First, the Department of Justice set off a a frenzy by showing reporters snippets of texts between two FBI agents who talked about politics and often criticized Trump. (The agents’ texts also criticized Clinton and other Democrats.) Next, they accused Mueller of violating their privacy by obtaining emails Trump staffers sent on official accounts during the transition. Of course, the two lines of attack blatantly contradicted each other: The Republicans were insisting their privacy had been violated at the very same time they were reveling in the violation of privacy of FBI agents. But the contradictions or shaky grasp of the law or facts has not mattered. As every loopy new theory has been debunked, a new one has emerged to take its place. They have all supported the continuing narrative in conservative media that the FBI is run by biased liberals carrying out an extralegal coup against Trump. It is working precisely as intended. The delegitimization of the FBI is “starting to win over mainstream conservatives,” a source close to the White House tells Mike Allen. On the one hand, Trump on Friday denied having any intention of firing Mueller. On the other, he railed against the FBI. (“It’s not looking good. It’s quite sad to see that. My people are very upset about it … A lot of lawyers thought that was pretty sad.”) Meanwhile, the president’s son-in-law has hired a crisis public relations firm, which is not a step one normally takes when anticipating legal exoneration. Cobb is floating his intention to “ask the special counsel if there are any other outstanding questions or materials that investigators need before concluding the probe.” This certainly has the appearance of a pressure strategy: Having invented his own deadline for the special prosecutor, Cobb can then demand that the investigation end when it fails to do so. 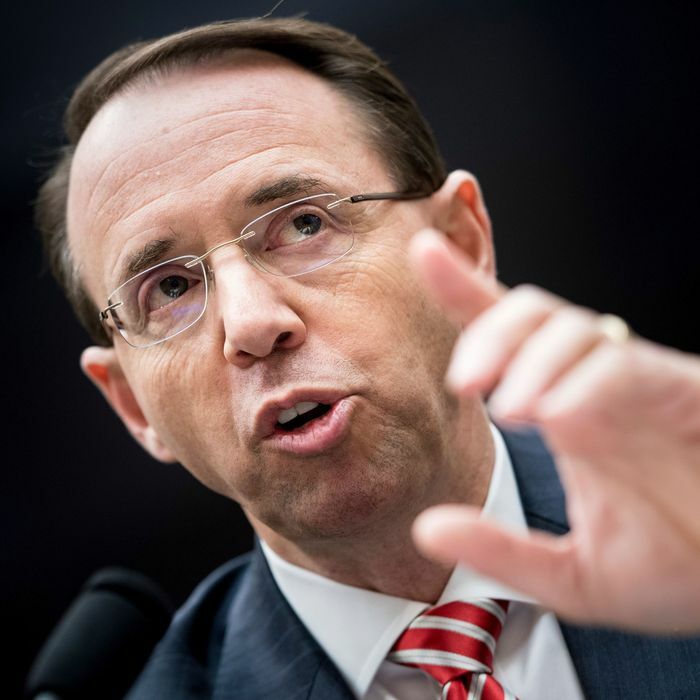 The most useful clue may lie in Trump’s fixation on Rosenstein, the deputy attorney general, and a figure whose centrality to the investigation has been underplayed. After Attorney General Jeff Sessions had to recuse himself from the Russia probe (thereby enraging Trump), Rosenstein stepped in and appointed Mueller. As former FBI special agent Asha Rangappa has explained, Rosenstein has exercised close and frequent oversight over the special counsel. If Trump wanted to stop Mueller’s work, he could replace Rosenstein with a more pliable figure. Trump has been raging on and off against Rosenstein for months. “His deputy he hardly knew, and that’s Rosenstein, Rod Rosenstein, who is from Baltimore,” Trump complained in July. “There are very few Republicans in Baltimore, if any.” The Washington Post reports today that, in private, “Trump has ranted about Rosenstein as ‘a Democrat’… and characterized him as a threat to his presidency.” In reality, Rosenstein is neither from Baltimore nor a Democrat. The demographic characteristic that has actually raised Trump’s Nixonian suspicions about Rosenstein’s loyalty is more likely that he is a Roy Moore’s lawyer–type. What all these signs are pointing toward at the moment — “at the moment” being a vital caveat in gauging a creature as erratic as Trump — is a confrontation sometime in January. When the third Cobb deadline has passed, and no Mueller exoneration has come, Trump’s wrath will need an outlet. The politically clever move would not be to directly attack Mueller, a symbol of rectitude who has collected encomiums from both parties. It will instead be to concentrate on the lower-profile bureaucratic operator, the “Democrat” who is “from Baltimore” and also loathed by Trump. And then, if he is shrewd, Trump could replace him with a new deputy attorney general who has more Trump-friendly ideas about the proper bounds of the Mueller investigation.